i wish i coulda posted straight through - damn sprint and their shoddy service! i'm not hungover, i'm just exhausted from being out all night. I have only ever been to a couple big concerts, otherwise my experience with live music has been in a bar setting, but when I went to Alpine Valley I could barely drive home in my beat up bug because my ears were ringing so badly. Hard to hear am radio over the roll of the highway through the flintstone floor besides! dresden dolls and nin? any others? 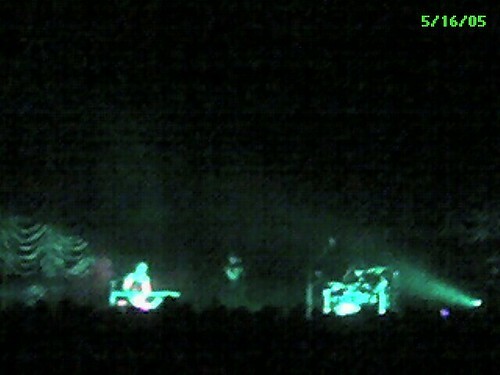 dresden dolls opened for nin last night. the hammerstien ballroom (where they played) is actually a "small" venue (2-3k tops), which made the show that much more enjoyable. i have been to quite a fistful of shows over the years. lest so recently, but msotly because there haven't been many bands on tour i felt it was worth shelling the bucks out for. back when i was a regualr concertgoer, it was a bit cheaper. driving deaf is not fun. lots of people had earplugs last night - something i would probably do if i was a regular concertgoer. ah, yes, I always think about ear plugs after the fact, too. I get addicted to my shop vac and after sucking up every spec of whatever I cannot hear at all. . . not nearly as much fun as a concert, though.